King Shattaf / Bidet Spray | LION Automotive Car Care Products – SARIA International, Inc. The economy version of the Saria Shattaf, The KING Shattaf is also molded from Dupont Derlin material offering high strength and scratch resistance qualities. 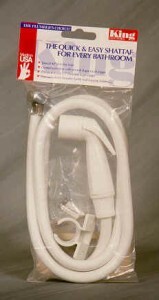 The 4 ft. hose is nylon braided to provide burst pressure of up to 700 p.s.i. at 70 O F. The 1/2″ hose connector is available chrome plated for attractive appearance and the connector is also available in plastic at a lower price. KING Shattafs are available in black and white colors with individual packaging for peg board hanging.